The 8tracks app lets you enjoy unlimited access to 8tracks channels and exclusive content live and on demand through Xbox Live and your Xbox 360 console. Listen to millions of songs and playlists curated by people from around the world. Browse or search for 8tracks. Select 8tracks to download and install the app. After the download, the app automatically starts, and you can browse through and view details about the available content. To start the 8tracks app later, go to music, My Music Apps and then 8tracks. To listen to 8tracks, go to music, My Music Apps and then 8tracks. From the home hub, you can browse content by using a category filter—STAFF PICKS, FEATURED, NEWEST AND TRENDING. For other browse options, try search and explore. You don’t have to create a profile or sign in to use 8tracks. However, creating an 8tracks profile enables you to save your favourite mixes, follow great DJs and pick up where you left off across all your devices. From the Profile hub, select either Sign up now or LOG IN to go to the log-in screen. On the log-in screen, you’ll see a code. 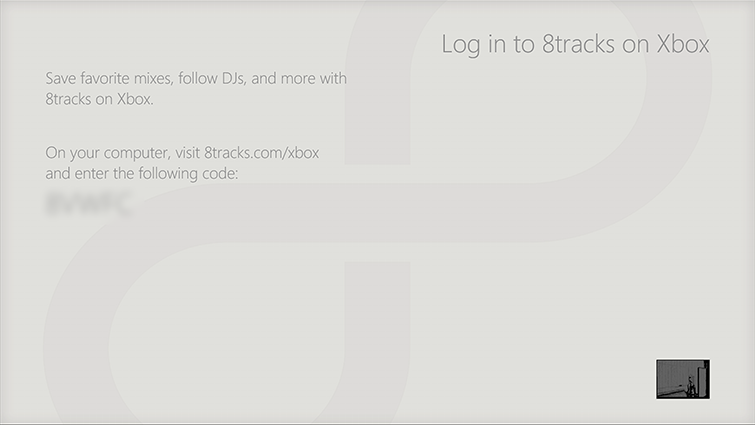 Enter that code on the 8tracks website to activate your Xbox 360 console as an 8tracks device. 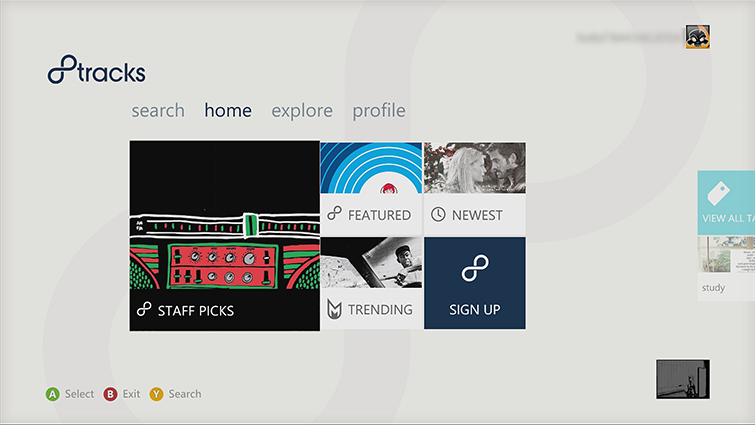 In a browser on a PC or other Internet-enabled device, go to 8tracks.com/xbox to sign in or create a new account. 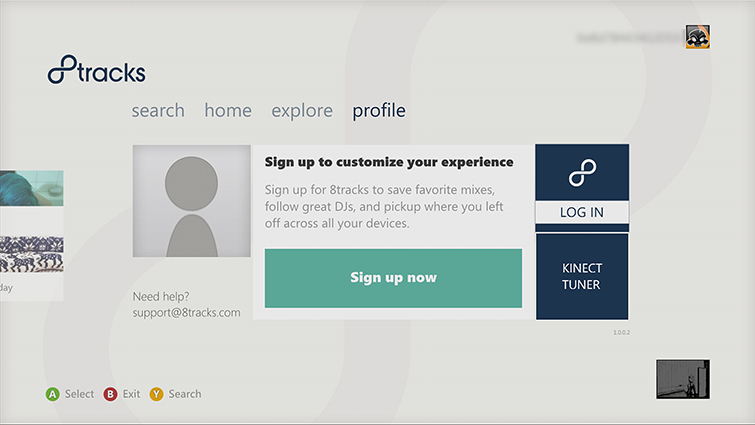 Once you’ve signed in or created a new account, enter the code from your Xbox screen to link your profile to your 8tracks account. After the code is verified, you’ll see a “Success!” message on the website and on your Xbox screen. In the 8tracks app on your console, go to the profile hub and select LOG OUT. 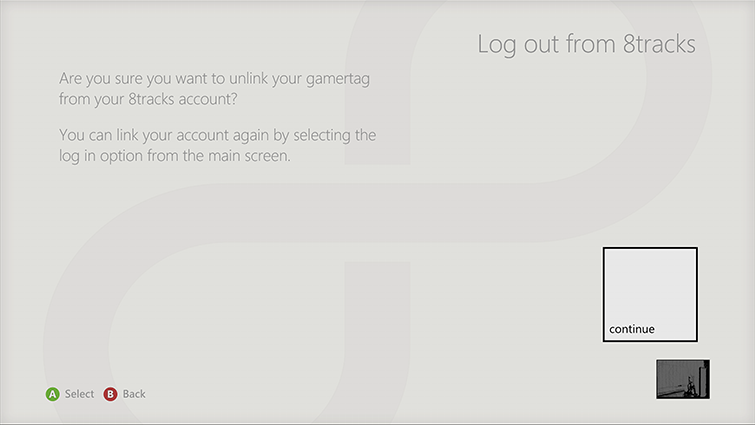 You’ll be prompted to confirm that you want to unlink your gamertag from your 8tracks account. Select continue. If you use Family Settings to control what kinds of content can be accessed through Xbox Live on your console, the 8tracks app will follow those settings. For example, if you use parental controls to restrict access to explicit content, that content will be marked with a "restricted" icon in the 8tracks app. To play a restricted item, an adult must enter the Family Settings pass code. Would you like to contact Support regarding the "Set up and use the 8tracks app on Xbox 360" issue you were reading about or a different issue?